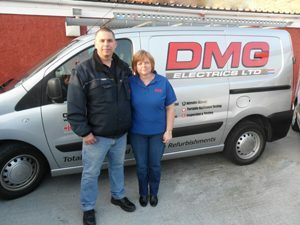 DMG Electrics Ltd was established in September 1978 and is managed by David Graham. The Company has been working within the Electrical Industry for over 30 years carrying out various types of electrical works. Many of our clients have been using our services for 20 years plus and we believe that the personal approach helps to maintain a friendly and lasting relationship with our clients. The Company is based in Comber Co. Down carrying out contracts in Co. Down, Co. Antrim and further afield. All of our Engineers maintain up to date qualifications for the latest regulations to ensure your safety. DMG Electrics Ltd is a member of the NICEIC (the National Inspection Council for Electrical Installation Contractors) and holds full accreditation as an NICEIC Approved Contractor and Domestic Installer. You can browse the information on this website to find out more about the work we carry out, you can also find our contact details, or request a quote. DMG Electrics © 2019. All Rights Reserved.